If you follow Dockwa on social media, you may have already seen our latest update announcing our new Contracts tool for marinas. Here's the quick scoop on what Dockwa's long term dockage management means for boaters. If you're someone who likes to get the news right from the source, you can read our press release or marina blog, or visit dockwa.com/contracts. Since this is a marina-facing tool, there's not a whole lot for boaters to do except, well, tell your marina that you think they should check it out. Worth noting: the Contracts tool is free, just like our transient reservation management tool. What happens behind the scenes to get you to this point? The marina creates its pricing groups, creates or finds your boat specs, adds your boat to its group, and tacks on any customizations you've requested (trailer fee, etc.). 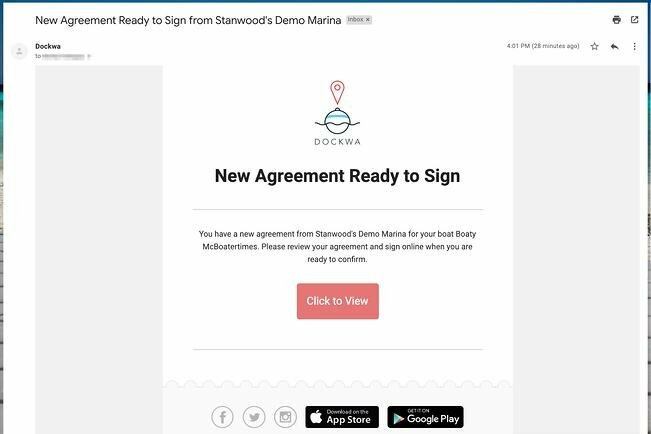 When the marina then clicks "Send Contract" in Dockwa, our Contracts tool automatically calculates the pricing and creates your custom contract. There's less room for error, less time spent mailing or emailing you and a hundred other boaters individually – you get the gist. You'll then click the button in your email, which brings you to a secure site where you'll sign your dockage agreement and pay securely online. Your marina can see whether and when you've done so, and can resend your contract or re-up your contract for future time periods with the click of a button. More than 740 marinas now use Dockwa's transient reservations tools; we worked with many of them before and during the development of our Contracts tool and will continue to improve as more feedback comes in. The consensus thus far is that using Dockwa Contracts already looks well worth the initial setup effort in exchange for saving hours – weeks for some marinas – of manual customization, manual sending, and manual tracking for the years to come. Let your marina know about our Contracts tool for long term dockage management – point them to dockwa.com/contracts, or get in touch with becky@dockwa.com and we'll shoot'em a quick email to help get them started.